Since VMware first introduced Desktop Virtualization back in 2007 creating a whole new market for us and our competitors (you are welcome BTW 🙂 ), we have learned a ton from our customers about where View is a good fit and delivers great business value. The recently launched Mobile Secure Desktop solution from VMware summarizes pretty well where the View sweet spot is: the intersection of security and mobility. In this sense, I don’t disagree with the premise of Brian Madden’s book “The VDI Delusion“. Besides the provocative title, Brian’s point is that VDI is (and I quote) “awesome” for the right use cases. The market is bigger than he assesses in the book, but I do agree with him that is still a huge installed base of physical desktops and end users in the enterprise for which a centrally run desktop is not the best fit. This is why VMware bought Wanova. People have been wondering whether we did this to improve View or whether we are are going to keep their commitment to manage physical Desktop and Laptops. The answer is both!! In summary, Wanova Mirage allows us to deliver some of the same benefits of View to physical desktops and laptops and opens up a whole slew of new use cases for our customers and market opportunity for us. We have been looking to implement or buy a technology like this for a while and when we ran into Wanova, we thought their technology was amazing and we are delighted to have their talent on board. Wanova’s technology will also be used to beef up View and make it applicable to more use cases. I am referring to Wanova’s highly efficient WAN data transfer, branch caching, dedup on disk and on the wire, and their Windows image layering technology. You will see these great innovations make their way into the View code base over time. 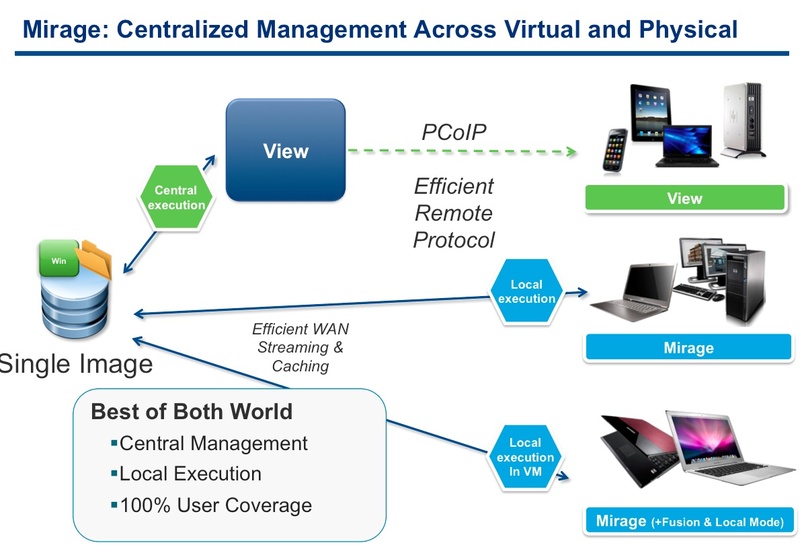 We do NOT see the world of End User Computing exclusively through the lenses of Virtual Machines and I am very excited about this opportunity to redefine what desktop virtualization is and how it fits into our vision for EUC. Stay tuned for more information on all this at our upcoming user conference in San Francisco and Barcelona. Great fit for VMware EUC and ties things together nicely! Wanova was a great acquisition for VMware but, like we saw with the RTO acquisition, it will be about how long it takes VMware to integrate the technology and which features make the cut. Lets not forget how long it takes VMware to get things like Octopus, Horizon, Project Redwood/vCloud Director, etc. to market. Do you really believe VMware started the VDI market?? Are we forgetting WinFrame/MetaFrame/Presentation Server/XenApp Published Desktops Citrix has been going for over a decade? Even the Citrix Desktop Server 1.0 broker was released in April 2007 as a shipping product, where VDM was not until the end of the year. http://www.citrix.com/English/ne/news/news.asp?newsID=165810. You should also update your article, http://journeytocloud.com/2011/06/27/the-history-of-vdi-view-vmware/, because your timeline is incorrect. I love the competition but lets be humble and honest. Every analyst will say Citrix started and continues to lead VDI/SBC, and VMware started and leads Server/Data Center Virtualization. Knowing exactly what happened with RTO, I can tell you that this is a major strength of VMware. We do take the time to properly integrate the technology we buy into our platform and if the technology is not up to our standards, we take the time to fix it. Wanova technology and the Mirage product are excellent and ship TODAY. The integration with VMware View for the right use cases will happen over time in a a manner that allows us to keep the high product quality we are known for. Our competition is indeed nimbler in getting stuff out in the market but customers can tell by the major seems that exist in between the many products they assemble together. Citrix acquired XenSource only in August, and started to ship XenDesktop in may 2008. XenDesktop was the third VDI product released from Citrix in May 2008, http://www.citrix.com/English/NE/news/news.asp?newsID=1453019. The naming came from the XenSource acquisition which allowed Citrix to rebrand their VDI Suite (smart marketing). On to VMware… In the past VMware had the Virtual Desktop Alliance where they partnered with other VDI solutions including Citrix Desktop Broker and Citrix Desktop Server to enable more sales of their hypervisor. When VMware saw the customer demand and other vendors like Citrix, Leostream, Provision Networks, and Properto making money from VDI on top of their hypervisor they acquired Properto to offer their own solution, VDM. VMware’s FIRST VDI product to market was VDM, which was released January 2008, http://virtualization.info/en/news/2008/01/release-vmware-virtual-desktop-manager-2.html. Now that we have a correct timeline I hope you adjust your blog. There is no doubt that by VMware making the hypervisor mainstream it enabled Citrix and others to develop the VDI market. Although VMware helped in creating the market with the contribution of their hypervisor, they are definitely not the pioneers of VDI or desktop virtualization as we know it today. I hate when server virtualization guys say that terminal services or XenApp published desktops are not a form of VDI. “VDI” is a just a term like “Cloud”, not a solution. If I can provide 50,000 users a published XenApp desktop with all their applications, home drives, data, etc. 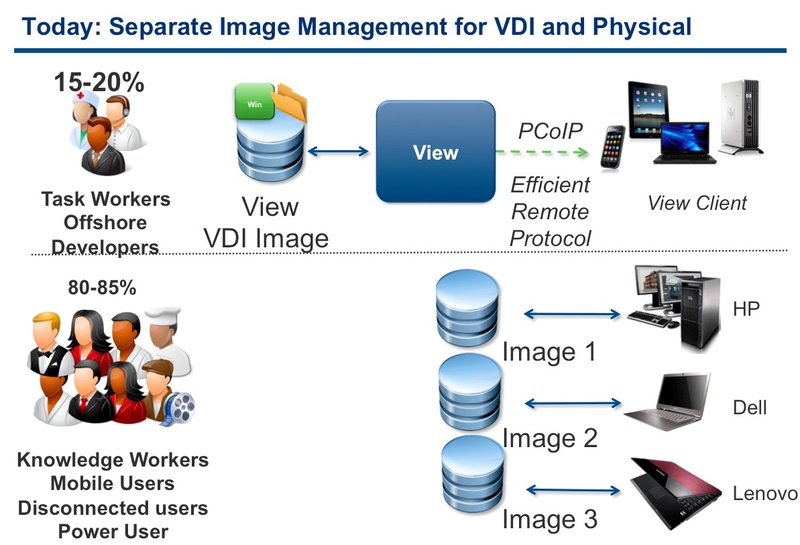 from any device, anywhere in the world, how is that not a form of VDI? Especially when you can still provide the same benefits of single image management using Provisioning Services; the same benefits of virtualization by running virtual XenApp server; and the same benefits of the ICA protocol. The only difference is how you scale the architecture. VMware guys like to play semantics with the term VDI but in the real world customers still see that as “VDI”. Those early types that you mention, don’t fit the “V” in VDI, as they were really connections to a Multi-User OS over ICA…those customers mentioned in http://journeytocloud.com/2011/06/27/the-history-of-vdi-view-vmware/ would be the true pioneers of VDI…with XP virtualized on ESX, and I’m sure there are others that we’ve never heard of. Citrix has been in the ThinClient biz for a long time and most veterans in the industry think of Citrix first when it comes to that…but the game is changing and the competition is heating up. Holy crap guys. Settle down or you won’t get any dessert. I could care less who was first to market. Just discuss the things that matter to customers like current solutions and roadmap. Sheesh.